Having best comfort while reading in bed or watching the favorite TV show is one of the most important things that count when it comes to comfort in bed. You don’t want to have to struggle with a pile of pillows for looking for comfort, which is why a bed lounge pillow may be the pillow you need. 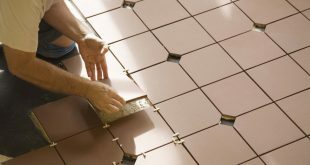 There are plenty of options out there and it’s important to know how much you’re willing to pay for it, in the first place. 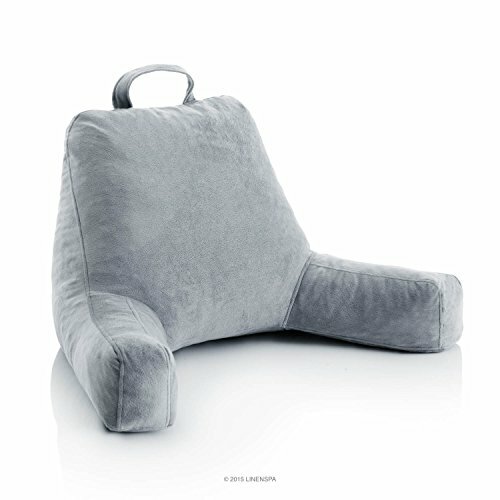 You want the bed lounge pillow to sit up straight, but you don’t want it to be too rigid either. The more adjustable it is, the easier for you it’s to find the best setting for your head and neck. You want longer arm rests for more comfort in your arms as well. A good bed lounge pillow doesn’t compromise on the looks either and you want something that has a nice, easy to match color too. The cover should feel nice against your skin and ideally, it’s easy to remove for cleaning. Don’t forget about the portability and the weight of the bed lounge pillow. You want to be able to carry it away easily, but you don’t want it to be too heavy or too lightweight either. The options are many and it’s your budget and your likings to have the final word. One of the people’s favorites out there when it comes to bed lounge pillows, the LINENSPA Shredded Foam Reading Pillow checks many boxes when it comes to comfort, versatility and fair price altogether. 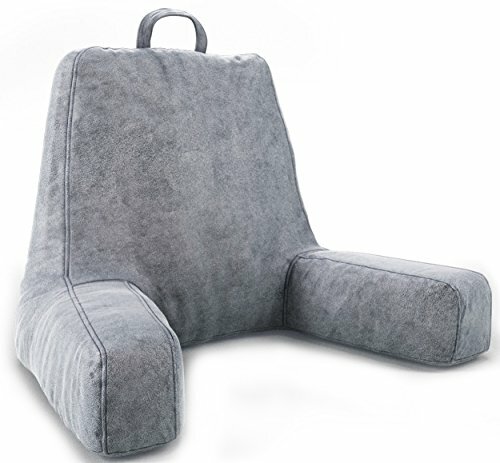 The pillow has a well thought out design so you have a good back support, but also a nice support for your head too. It’s not going to be as difficult as before now to read a nice book in bed or to watch a TV movie. The armrests are long so the comfort for your arms isn’t bad at all. As a matter of fact, they really feel plump and comfortable, offering good support too. 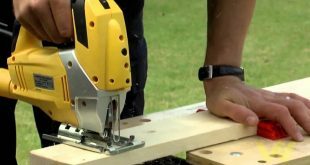 The pillow is made with shredded foam, maintaining its shape for a good amount of time. The fill is responsive so that pillow comes back to its shape over and over again. The pillow is firm enough to give good support, yet flexible so that you find the best position for your head, neck and back. Even though it’s made with shredded foam, the pillow is quite breathable so you don’t end up all sweaty at the end of your TV show. The plush cover feels nice against the skin, giving you a cozy feel. The pillow comes in a neutral color so it’s not difficult to match your bedroom décor, no matter which color theme it may have. 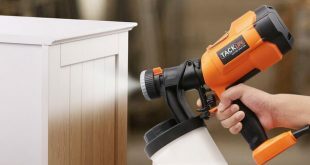 The cover doesn’t pick up dirt easy and it’s easy to clean. The handle on top gives the pillow amazing portability. The pillow doesn’t slide away and it’s freestanding. The double stiches are well made, leaving a durability feel. The pillow comes in a compact box and it may need a while until it fully expands. Supportive, portable and easy to shape up, the bed lounge pillow comes for a fair price too. All in all, as it’s supportive, comfortable, well priced and easy to carry around, the bed lounge pillow is a good buy for any tight budget. The warm grey color of the Ziraki Large Plush Shredded Foam Reading and TV Relax Pillow makes it easy to match in any décor, but the pillow brings many other good things to the table. The pillow is made with good quality shredded foam so it’s not only easy to mold, but also quite breathable. Therefore, not only you get to shape it as you want for the best fit to your neck, head, and back, but you’re also not sweaty when you’re done with your reading in bed. 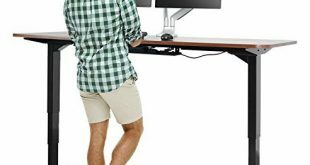 The design is good and you get efficient support for head, arms and back while watching a TV show. The velour cover has a soft plush feel so you feel nice and cozy when using it. When in need, you simply spot it clean with a damp cloth and detergent. The pillow has a carry handle so you don’t need to put any special efforts into carrying it around. The pillow is well made and stays in place, without shifting. It’s comfortable and easy to fit in, no matter how your bedroom looks like. Even though the bed lounge pillow isn’t the most popular choice out there, it’s still a comfortable, supportive and easy to color match pillow, especially considering its price. You know you got your hands on a good bed lounge pillow when everyone you know already has one. It’s the case of the Brentwood Originals Brushed Twill Bedrest that comes with many good things attached to it and only inherent downsides. The design of the pillow is well thought out and the pillow offers good support for your back, neck and head as well. 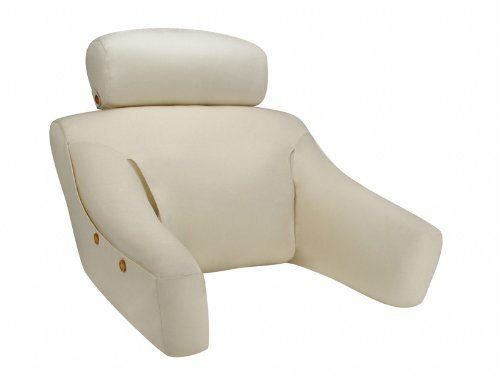 The armrests design doesn’t disappoint either and you get nice comfort when reading in bed and using the pillow. The pillow is made with good quality materials and doesn’t lose its shape too soon. The cover has a nice feel to it and is grippy. The pillow stays in place and you don’t have to constantly re adjust it. The cover is made with polyester brushed twill that combines efficient with the polyester fiber fill. For anyone fighting some allergies, the pillow is a safe choice too. The handle on top makes the pillow easy to move around and the pillow isn’t heavy weight, which makes carrying a lot easier. Another good thing to add on the list is that the pillow is good for anyone breastfeeding as it’s wide and tall, giving nice comfort and support. There are many nice colors to choose from so you get to pick one that matches your bedroom décor the best. However, as it’s portable, supportive, easy to carry around and comfortable, the bed lounge pillow is a solid choice in most situations. 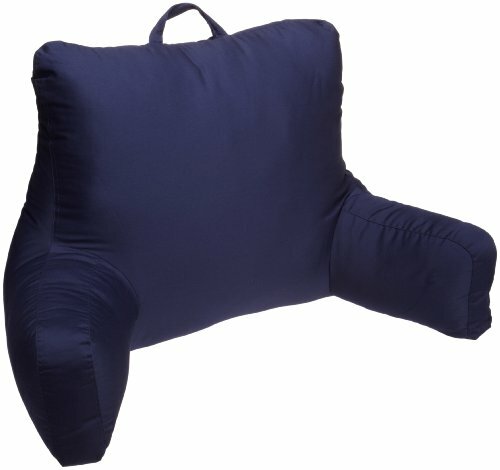 For those of you looking for a firm bed lounge pillow, the Deluxe Lounger – Great for Reading, Watching Tv, Gaming – Adjustable Neck Rest is a reliable choice. The bed lounge pillow is made with good quality materials, here at home in our USA. Its ergonomic design includes a height-adjustable neck support and an engineered foam frame. 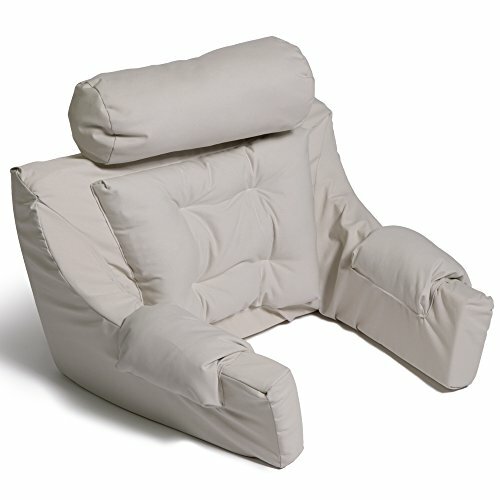 The back pillow is only softly padded, whereas the armrests are cushioned for increased comfort. The pillow has a durability feel to it and it features a twill cover that takes the use for a long time. The cover is breathable, repelling moisture so you may sit for hours and watch a movie, without getting all sweaty until the end of it. The foam build seems durable and the pillow gives the firm support that you may have been looking for. The pillow comes in a nice, natural color so finding its place in your bedroom isn’t going to be difficult as it blends quite easy. Even though it doesn’t come with a handle, the pillow isn’t heavy weight so moving it around isn’t that difficult. Anytime when in need for a firm, supportive, comfortable and easy to fit in any bedroom bed lounge pillow, this one is quite a wise buy. How much are you willing to pay for your comfort when you’re reading in bed? If money isn’t a big deal to you or you simply make no compromise when it comes to your comfort, put your money at stake with the BedLounge Classic – Regular – Natural Cotton. Ergonomically designed, the bed lounge pillow certainly brings plenty of good things to consider when getting it. 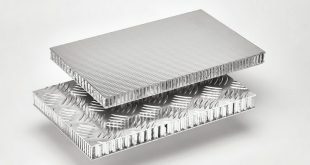 Its adjustability on several levels is its strength, but the pillow does check many other quality boxes too. You may raise or lower the headrest up to 12” to where it gives you the best comfort, whereas the armrests are flexible so any body shape or size finds the best setting. The pillow comes in small and regular sizes so you may need to check the info before placing your order. The lumbar pillow is another efficient detail on the pillow and it’s easy to remove in case you don’t want it there anymore. The headrest is also easy to rotate, so the adjustments you can make are so complex. The cover feels also comfy and nice against the skin. It’s easy to remove for cleaning, when in need. The list of good things ends with the fact the pillow is made in our USA and this may seal the deal for many. 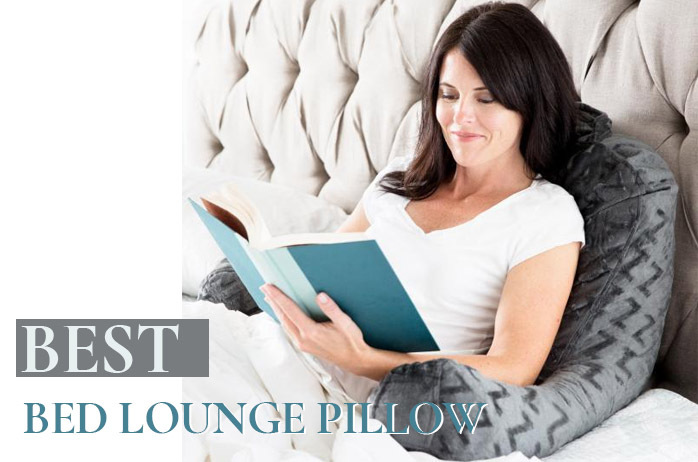 Comfortable, adjustable and made in USA, the bed lounge pillow is a great investment to make for your comfort when reading in bed.